On September 29, 2012, the day of the consecration of the Yezidi holy place, ziarat, in Aknalich in Armenia’s Armavir province was declared by the Yazidi spiritual leader Mir Mira Tahsin Beg as a day of the holy place, where every year on the same day ceremonies are held. 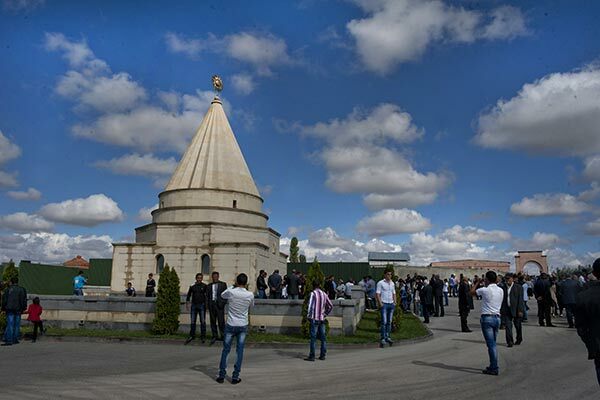 In the territory of the sanctuary, besides the temple, there is an Armenian-Yezidi friendship complex with statues of worthy sons of the Armenian and Yezidi peoples, Usub bek, Jhangir agha, General Andranik. The holy place is surrounded by a large green space. Click here to view photo-gallery.